The lovely church of St Margaret of Antioch is as calm and beautiful as it would have been in the days when Florence Nightingale lived at nearby Embley Park, one of the houses that Florence loved the best. 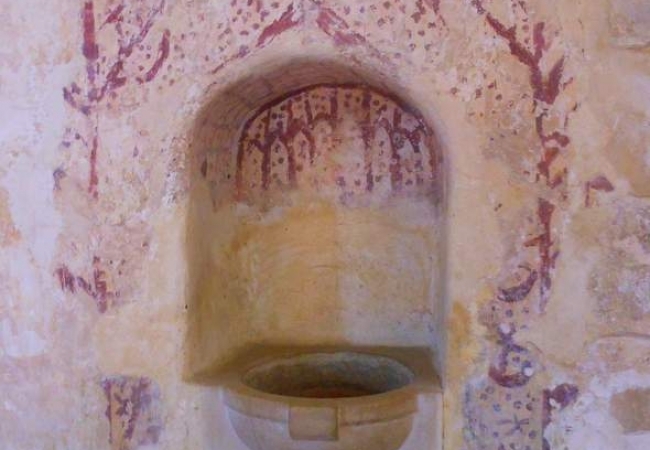 The 13th century church has many lovely and interesting features, the wall paintings are especially interesting. The unusual painting of St Christopher is an early depiction of the saint. We know this because he is carrying an eel stick in his hand as he carries the baby Jesus across the waters. At his feet in the lapping water, small eel can be seen swimming. In later depictions, the eel stick has become a staff. St Mary of Antioch is also there, spinning away as she spurns the advances of Olybrius. Another later painting is a scene of observers looking over the parapet of a wall at Daniel in the lions den (alas Daniel and the den are no longer there) an interesting 3D painting. A painting of the massacre of Thomas Becket can just be made out. Heads of kings, maybe King Henry III and many other pieces of decoration must have made this a stunning place for the Medieval congregation to worship in. The twining flowers, either five petaled or bell flowers were thought to have been painted in about 1270. All in all a remarkable survival. There are obviously many memorials to Florence Nightingale and despite an unfortunate theft in the 1990’s of the Scutari Cross, made of bullets from the Crimea, a good replica has been made and placed alongside a simple framed text that once hung in Florence’s bedroom. The whole is modestly done, in keeping with the great lady herself. Do not look for a grand memorial to Florence, she lies with the rest of her family with nothing but her initials and the year of her birth and her death. Look out for the unusual cluster of consecration crosses. There are eight of them, each one different and it is thought from different periods. For whatever reason, a visit to East Wellow church in Hampshire will be an enriching experience.